from Ordean East and Lincoln Park! with a Young Eagle flight and and an awards program! Check this website before you arrive for a Go or No-Go based on the weather. Bring your Young Eagle form, a folding chair, and your smile. Pizza and treats will be available after the flights for students. Please donate to the Spirit of the Lark Fund! Donations will help fund the Path to Aviation Middle School Program and maintain The Lark of Duluth. Over the last 5 years, the Duluth Aviation Institute built The Lark of Duluth replica in preparation for the Commercial Aviation Centennial and to document Duluth's contributions to this important era in aviation history. The Institute's President, Sandra Ettestad, stated, "We have had an exciting historic journey stepping into the past when aviation was in its infancy. This beautiful replica represents the spirit of innovation and entrepreneurship while reminding us of the challenges our forefathers took to understand the science of flight." Efforts to preserve our aviation history have proven, over and over, to be a daunting task. The Institute trustees admire the successes of such efforts but also the failures as they teach us how far we have come in aviation in the last 100 years. With nothing more than archival black and white photographs and written descriptions published in 1913, the Lark was built as accurately as possible to the original. The Institute's replica was damaged during a test flight on Tuesday, July 16, 2013. The pilot and project manager of the replica project, Mark Marino, and his building crew have meticulously gone over every part of the airplane and its flying characteristics. To build an authentic replica, the controls would have to be unconventional by today's standards. The original Lark had a throttle pedal and rudder lever which is opposite current day controls. The replica has now been modified to reflect a current day configuration and to provide Lark pilots a safer platform for future flights. The airplane has been repaired and is ready to resume flight testing during the summer of 2014. Duluthians Julius Barnes and W. D. Jones were owners of The Lark of Duluth flying boat but more important, they were visionaries, seeing the potential benefits for society. They gave the pilot, Tony Jannus, and manufacturer, Thomas Benoist, permission to use The Lark over the winter to develop a flying service. 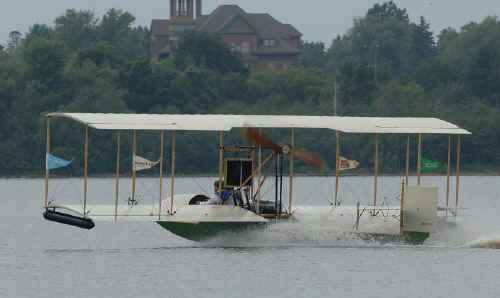 The airplane was modified and shipped by rail to St. Petersburg, Florida arriving on December 31, 1913. On January 1, 1914, it was launched from the St. Petersburg's waterfront and flew the inaugural flight as the world's first "airliner". 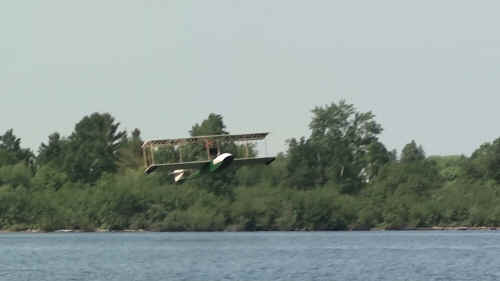 The airline flew 1,205 passengers, one at a time, between January 1 and May 5, 1914. The Lark flew the following summer in Duluth for the 1914 Lark O' the Lake Carnivals. The Institute would like to acknowledge all the support they received from the community during the building process. The replica was built for the Institute by its trustees and experimental aircraft builders from EAA's Duluth-Superior Chapter 272 and Cloquet Chapter 1221. Mark Marino, an award winning builder, led the effort along with Tom Betts, Mike Shannon, Mike Gardonio, Jim Nelson, John Vanderhorn, Curt Gehrke, Steve Dorsey and Sandra Ettestad. Cirrus Aircraft, HydroSolutions, Poly-Fiber Aircraft Coatings, Aluminum Cabinet Company, SCS Interiors, and Hangar 10 Aero contributed significantly to the replica project. The Lark of Duluth, the Benoist Flying Boat replica of the first airliner, was on exhibit inside the Duluth International Airport terminal from December 2013 through January 2014. 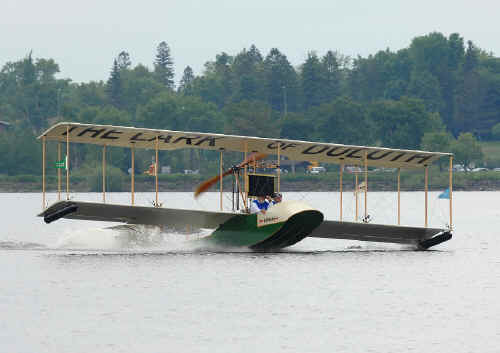 The Duluth Aviation Institute will be exhibiting the Lark replica at Oshkosh Airventure 2014 near the Vintage Barn area. 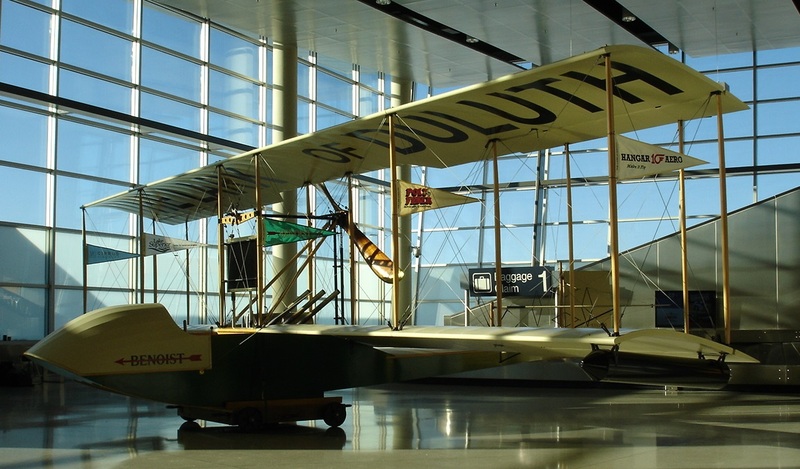 Celebrating our city's aviation centennial, the Institute is enhancing area schools science curriculum with Duluth's legacy of inventors and entrepreneurs. Our AeroSTEM (aviation, science, technology, engineering and math) program has been presented to 3,300 sixth grade students in Duluth and Proctor school districts and Marshall school for a total of 900 students per year.